H.E. Ambassador Arthayudh Srisamoot, we wish to welcome you to the Vienna family and congratulate you on assuming your role in the chairmanship of the CND, in this regard we wish you every success. Let me join previous speakers in welcoming you, Mr. Minister Morales, to the VIC and I wish to thank you for sharing your experiences which is equally important for Afghanistan. We welcome your initiative and pledge our full support. Afghanistan has been a prime victim of the global menace of illicit narcotics for more than a decade, addressing this menace remains one of our National Priority Programs and the newly formed National Unity Government is committed to contribute our share in combatting this transnational threat. We believe that illicit narcotics are a global challenge, which require a global approach by all countries in a holistic, balanced and integrated manner, to effectively combat this menace. We expect from all countries in our region, beyond and the IC as whole, to do their part based on the shared-responsibility principle. The Government of Afghanistan has taken practical measures at the national level to create a strong legal foundation, to build institutions, to develop policies in key areas of alternative livelihood, law enforcement, demand reduction and public awareness. At regional level we are expanding our efforts on bilateral, trilateral, quadrature as well as other mechanism including the Istanbul Process and at the International level, Afghanistan has joined all relevant regulations and instruments to join the international community addressing the World Drug Problem. We consider the 2016 UN GASS to be a timely and crucial event to address the World Drug Problem and we are dedicated to play an active part in the preparations for this historic event. The drug problem stands as one of the major challenges for us at the cusp of our Decade of Transformation 2015-2024. The new Government of Afghanistan has particularly high stakes in this process and are dedicated to playing an active part in this historic opportunity to achieving a global consensus to address this global challenge. 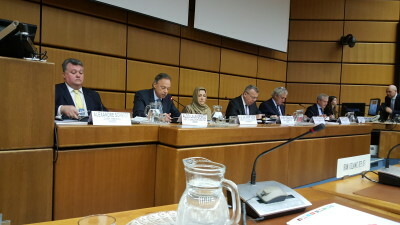 Ambassador Erfani delivered remarks at the 11th Paris Pact Policy Consultative Meeting today at the UNODC in Vienna. He discussed the challenges still being faced in the fight against narcotic drugs and added that this meeting could provide an opportunity to discuss the effectiveness of the Paris Pact initiative, achieved progress, new arising challenges and to look for practical solutions to meet the goals of these initiatives. Following the statement by Deputy Minister, Ambassador Erfani concurred that while Afghanistan has made significant progress for the last 13 years and is taking steps to its Transition into Transformation, there are still a number of challenges facing Afghanistan including the drug problem, of which Afghanistan has been a prime victim. It will remain a non-stop effort of the Afghan Government throughout this Decade of Transformation. He concluded by thanking the International community for their continued commitment and sacrifices so far, and will continue to cooperate with Afghanistan in post-2014. H.E Ambassador Ayoob Erfani attended the meeting of the World Drug Report 2014 on 13 June 2014 where he spoke with much on the considerable progress made in different parts of the world on counter narcotics. H. E. Erfani stressed the importance of mutual cooperation to successfully combat illicit narcotics. Also, H.E. highlighted common effort directed towards mutual responsibility and respect. H.E. Erfani emphasized the importance of the drug issue to Afghanistan, and stressed its commitment in continuous efforts to create a strong legal foundation and policy environment for countering the menace of narcotics. H.E. Erfani dwelled on the ongoing revision of National Drug Control Strategy; the planned revision of the Law on Counter Narcotics, as well as the recent finalization of the Counter Narcotics Regional Strategy. Also, the development of multiple policies in key areas of alternative livelihood, law enforcement, demand reduction, regional and international cooperation as well as public awareness were signified. H.E. Erfani stated that due to the successful implementation of Counter Narcotic policies, the Government of Afghanistan has been able to seize close to 14% of the total drug produced and managed to arrest more than 3000 drug traffickers, including 500 mid-level and 6 high profile traffickers in the past two years. However, there is still work to be done. For example, effective demand reduction measures and target-aimed alternative livelihood programs are needed to address the issue of narcotics menace in the country. Firstly, my delegation is pleased to see you dear Mr Lemahieu, chairing today’s session. Let me thank you for convening today’s briefing on this year’s World Drug Report. I would like to thank the UNODC for the yet again excellent effort in preparing another detailed overview of the drug situation in the world. I thank Angela for the comprehensive presentation. We believe that, the annual world drug reports help to enhance knowledge about global trends in drug demand and supply, which is key to successful drug-related policy formulation and its implementation at national, regional and international levels. As this year’s report indicates, while considerable progress has been achieved in different parts of the world in addressing various aspects of the menace of narcotics, challenges still persist at all national, regional and international levels in countering this threat. Clearly, intensified and more integrated efforts with a comprehensive approach, based on the principle of shared responsibility are required. As a prime victim of the world drug problem, Afghanistan is committed to continue its efforts to create a strong legal foundation and policy environment for countering the menace of narcotics. The revision of our National Drug Control Strategy; the planned revision of the Law on Counter Narcotics as well as the recent finalization of the Counter Narcotics Regional Strategy are examples of our recent efforts to this end. We have also been able to develop our policies in key areas of alternative livelihood, law enforcement, demand reduction, regional and international cooperation as well as public awareness. Such efforts have led to considerable operational achievements in the past two years. As was reported by H.E. Mobarez Rashidi, Minister of Counter Narcotics of Afghanistan during the CND High-Level Segment in March this year, the Government of Afghanistan has been able to seize close to 14% of the total drug produced and managed to arrest more than 3000 drug traffickers, including 500 mid-level and 6 high profile traffickers in the past two years. While the market value of opium has remained stable, our economy has grown steadily. 60% of GDP was made up of illicit economy in 2003, which stands now at only 14%. 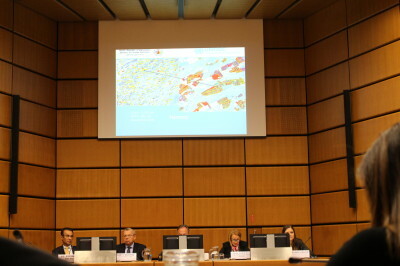 However, in order to more effectively address the recent increase in cultivation and production of poppy in Afghanistan, more intensified regional efforts in countering the trafficking of precursors into Afghanistan, effective demand reduction measures and target-aimed alternative livelihood programs are needed along with the eradication efforts in the country. There is also need for intensified efforts in the area of demand reduction at all national, regional and international levels. In Afghanistan, we have been able to increase our addiction treatment capacity from 1% to almost 6%, however, given the increasing number of addicts in the country especially among vulnerable groups, we need greater international support to further increase this capacity. Afghanistan was able to create a network of over 100 facilities across the country offering treatment. We look forward to the official release of this year’s Word Drug Report and also to improved coordination and consultation between relevant national authorities and our UNODC colleagues in the collection and sharing of data in the preparation of future annual world drug reports. Afghanistan is making every efforts to do its part and strongly committed to close cooperation towards eradication of illicit drugs.